As with many locations in Lorule, the key to accessing the Dark Palace is to find a way in. Lorule's geography does not make this easy. To get to the Dark Palace, travel to the Eastern Palace in Hyrule and check one screen south (the area is just north of the eastern edge of Lake Hylia on your map). 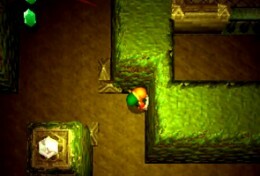 A crack leading to Lorule is found here, blocked by boulders you can quickly Bomb away. - Make your way up to the field of bushes here and kill the enemies. Before leaving, merge with the north wall and follow it all the way east and south. You'll find a Maiamai perched on the ledge in the south. Drop down onto the grassy field beyond to find a Great Fairy which will heal your wounds. Go north one screen and slam into the leftmost tree in the row of five ahead to reveal a Maiamai, then enter the Dark Palace area proper. - Head north. You'll be notified that the guards in this place will immediately imprison you if they spot you. True advice, too - if you meet the red-waved gaze of the guards here, you'll be sent to the prison cell in the south. If this happens, merge with the walls to escape between the bars. - We won't worry about the maze here just yet. Go east, past the second guard you see, and you'll find a Maiamai stuck to a wall. South of here is an exit back into Lorule. - South of this entrance / exit is a line of trees. Just north of the right end of these trees is a wall you can blast open with a Bomb. Inside are Fairies. - Follow the cliffs south towards Lake Hylia. At the end you'll find a chest containing 100 rupees. - Walk west until you're south of Lorule's rock field. On the west end of this screen is a tree; dash into it to find a Maiamai. - Walk north. Scan the rocks on the eastern side of the area. Another Maiamai is waiting, chilling atop a rock. Also in the rock field is an alternate route into this part of Lorule: a crack in a pedestal. - Carry on north along the water's edge until the path veers east. Jump into the water to find a Maiamai in the depths. 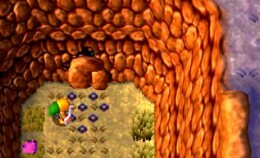 Near it is another crack you can use to cross back into Hyrule, though be warned - you can't travel back into Lorule if you go through. There's, ah, a bit of a drop. - You can continue east if you want, but there's not much point. The land kinda ends. Return to the entrance of Dark Palace and get to work infiltrating the place. - Head towards the first guard. Merge with the wall and you can sneak by him undetected, whether he's looking at you or not. - Further north there are two guards on patrol. Merge with the middle section of hedge here and wait for them to cross each other and walk towards the outer walls. Unmerge and run north before they can turn around again. - There's a split ahead. Run west and south when you hit the water. A guard on duty ahead will move his head left and right, trying to find you. Merge with the wall when he's stationary, slip past when his head is moving, and unmerge when he's stationary again. Past him is a chest containing 20 rupees. - Go north. There are two more patrolling guards. Merge with the right wall, slip past, wait for them to be facing north and south, then merge with the left wall. Go past the northern guard before unmerging. - Up a set of stairs are two patrolling guards; between the section they're patrolling is an open area with another guard. Weave your way around the thin columns here to reach the right side of the platforms. No fancy tricks, just smart timing. If you're especially fast you can grab a Heart Piece from a pole jutting out of the right side of this area. - At the bottom of the next set of stairs you'll find a Maiamai clinging to the hedges. - Carry on south. Another guard to dodge. Merge! - Beyond here you'll find a small intersection with three guards. Merge with the central hedge once the path is clear to slip past the first two guards. Don't unmerge to the north until the guard watching over the northern path stops swinging his head around. Then merge with the far wall and slip past. - One last guy. 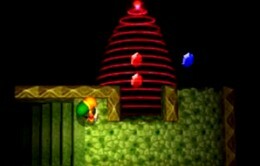 You can either slip past him the easy way or be tricksy and try to grab the two rupees in front of him when he's moving his head. I wouldn't recommend it. - All done. Run north, activate the local weather vane, and use a Bomb on the entrance to Dark Palace. Dungeon is ready to be infiltrated.